What is buffalo horn? What is it used for? Buffalo horn comes from the Indian buffalo, also known as the water buffalo, a cud-chewing animal found throughout southeast Asia. 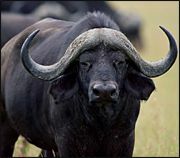 Massive, incredibly strong, but not very intelligent, a water buffalo can reach a height of more than five feet at the shoulder, and can weigh more than 1,500 pounds. A single horn can be up to four feet long, curving outward and backward from the animal's head. After being removed, the horns are cleaved in half, soaked in hot water, cleaned of any impurities, sliced, and dried in the sun for use in herbal remedies. Buffalo horn is comprised of a variety of chemicals and substances, including keratin, glutamic acid, aspartic acid, and the amino acids cystine, leucine and arginine. Buffalo horn also contains several trace elements, including sodium, magnesium, potassium, iron and zinc. It is salty in flavor and has cold properties, and is associated with the Heart, Liver and Stomach meridians. Its functions are to clear away heat, remove heat from the blood, and eliminate toxins. Buffalo horn is used to treat conditions such as fever, edema and convulsions. Buffalo horn can also be applied the skin to treat skin eruptions caused by febrile diseases. How much buffalo horn should I take? The typical dosage of buffalo horn is between 15 and 30 grams, ground finely and decocted or infused with boiled water; larger doses may be used for other conditions. It should be decocted for three hours. Larger amounts can be applied to the skin as necessary. What forms of buffalo horn are available? Powdered buffalo horn can be found at some Asian markets, as can buffalo horn decoctions and infusions. Buffalo horn is also included with some herbal formulas. What can happen if I take too much buffalo horn? Are there any interactions I should be aware of? What precautions should I take? Buffalo horn should be given with caution to patients suffering from insufficiency and cold of the middle jiao, or anyone diagnosed with spleen yang deficiency. As of this writing, there are no known side-effects or drug interactions associated with buffalo horn. As always, make sure to consult with a licensed health care provider before taking buffalo horn or any other herbal remedy or dietary supplement. Fan GP, et al. Comparative research on amino acid of guang jiao, shui niu jiao, and huang niu jiao. China Journal of Chinese Medicine 1996;21(3):139-141. Hong XK, et al. Comparative research on inorganic elements in guang jiao, shui niu jiao, and huang niu jiao. China Journal of Chinese Medicine 1996;21(2):76-77. Jia YY, et al. Comparative analysis on hydracid and trace elements in shui niu jian and ling yang jiao. Journal of Shizhen Medicinal Material Research 1997;8(3):216-217. Jin RM, et al. Research on pharmacological effects of xi niu and shui niu jiao. Journal of Chinese Patented Medicine 1997;19(7):33-34. Mao XJ, et al. Experimental research on mixture of cao wu and shui niu jiao. Journal of Yunnan College of TCM 1997;19(7):33-34.